Courtney is a mama bear, yarn hoarder and all-around craft lover from East Providence, Rhode Island. When she’s not mom-ing, she teaches hip hop classes at a local dance studio and spends most of her weekends in the fall selling crochet baby goodies at craft fairs. 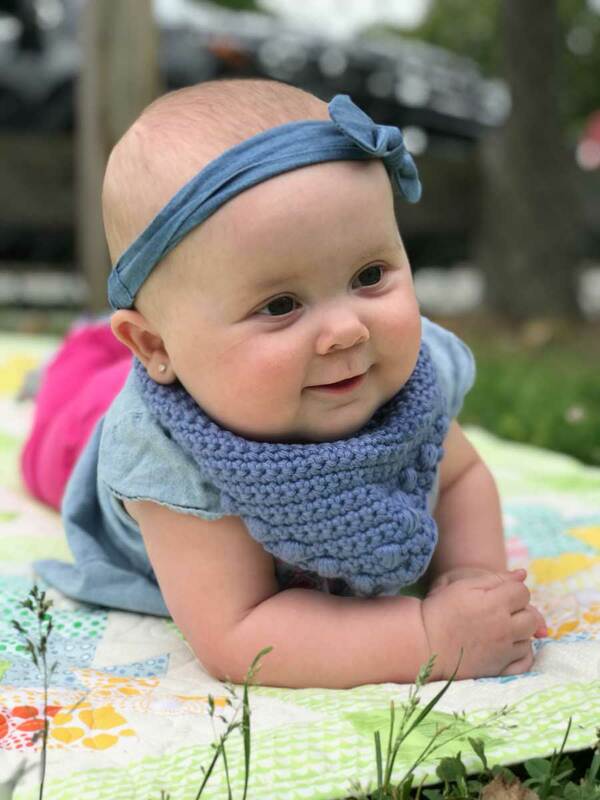 She finds inspiration from her own life, friends and family when making, and strongly believes that every baby should be born into the world and wrapped in handmade. Hi guys! My name is Courtney and I’m the hands behind Hey Baby Crochet. If you couldn’t tell by my shop name, baby items are kind of my jam. I think it suits me perfectly because my maker journey began at the same time I started another journey in my life – motherhood. It was just about three years ago that I found out I was expecting my first child. I was terrified – excited, but terrified. I read every baby book, every parenting blog and joined every first-time mom support group that I could find. I knew what a gigantic lifestyle change this would be, and I was ready for it. What I wasn’t ready for, was how motherhood would change ME. During my pregnancy I developed complications that pulled me from work and left me on bedrest. I went from working three jobs at over 60 hours a week, to not working at all. I’m one of those people that HAVE to keep busy. (I’m sure many of you makers can relate!) After finishing a ridiculous amount of DIY nursery projects and exhausting my Netflix queue, I decided I would pick up a crochet hook and try to make something for our baby. 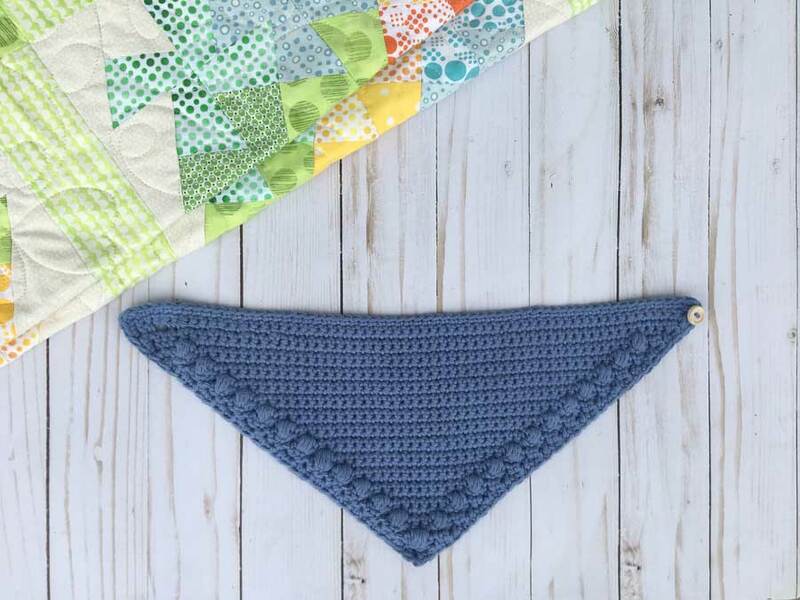 After quite a bit of practice, trial and error, I taught myself how to read patterns and eventually made crochet props for our newborn photoshoot. Despite those pregnancy complications, I delivered a beautiful, healthy, perfect baby boy. I never did return to work after that, and honestly, I took it hard. I didn’t have a career anymore, I wasn’t contributing financially to my household and if I’m being completely honest – I wasn’t much of a housewife either. (I’m a terrible cleaner.) 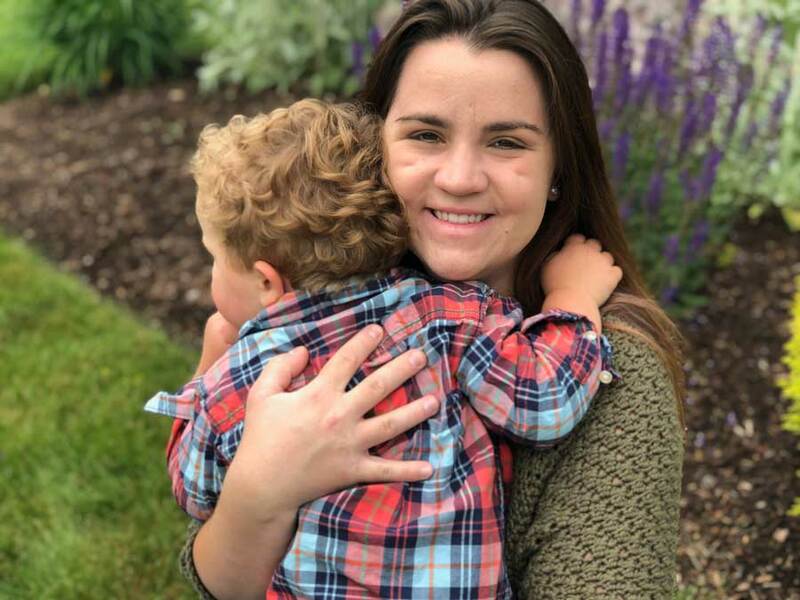 All I was, was “Mom.” Even though my son made my heart so full and I love that little boy more than I ever thought was possible, something was missing. I didn’t feel like I was a good mother, I felt like I was failing. I developed postpartum depression and let me tell you, the struggle was real. I wasn’t “Courtney” anymore. I really did lose myself. Eventually, our son’s newborn photos came back and the response from friends and family was unreal. They loved the outfits I made and encouraged me to begin selling them. Shortly after that, I discovered the maker community and all of the other maker mamas out there – including Jessica. I was so inspired and thought, “if they could do it, so could I.” Since then, I’ve written several patterns, opened an Etsy and Ravelry shop, and participated in more craft fairs than I can count. I’ve not only gained the confidence to put myself out there but have also made so many lasting relationships with other makers I’ve met along the way. The maker community quite literally helped me find myself again when I thought I lost “me,” and for that I am forever grateful. My son is over two years old now, I’m expecting identical twin boys this summer and I’m still a stay at home mom. Even though I’m still terrible at keeping a clean house, (oops) I have no doubt in my mind that I’m a good mom – a GREAT mom, really. It will always be my most important and treasured role. But what I’ve learned over these past few years didn’t come from any of those baby books or parenting blogs. In order for me to be the best mother to my children that I can be – I need to be doing something for myself too. For me, that “something” is finishing crochet orders and prepping for craft fairs in between toddler swim classes and prenatal doctor’s visits. 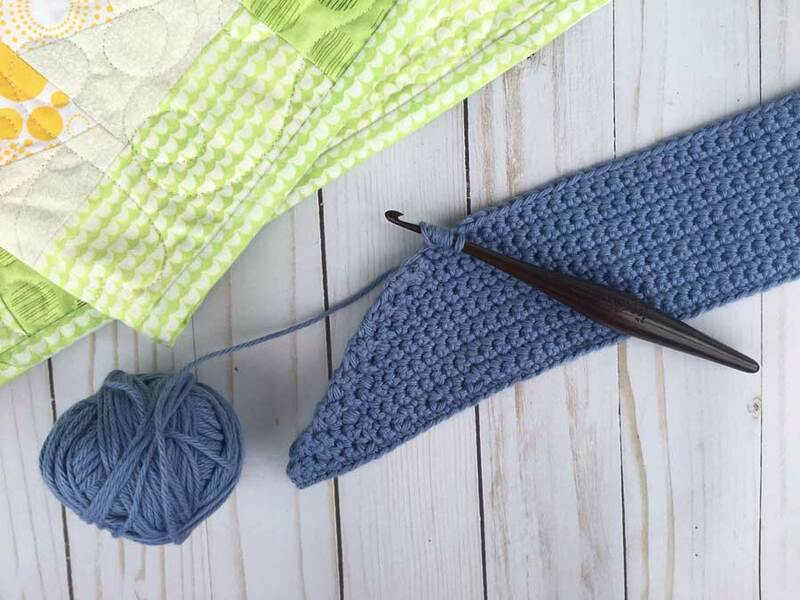 Today, I’m super excited to share a fun, new crochet baby project! The Everett Bandana Bib, named after my own sweet boy, is the perfect make for a new little one. Boy or girl, this would be the perfect addition to a new baby gift that any mama would love and appreciate – and most importantly, USE! Babies go through bibs like nobody’s business and I truly believe it is extra special for all babies to wear handmade whenever possible. - PUFF: *Yarn over, insert hook. Yarn over, pull up a loop. * Repeat * 3 more times. Yarn over, pull through all 9 loops. CH 1. - BACK BUMP: the hidden loop behind your chain. If you are not familiar with this technique, you can absolutely SC in the CH as you would normally – I just think this technique makes your finished project look neater. *** If your gauge does not match, adjust hook size up or down as necessary. - This bib is made in ONE SIZE, but it’s intent is to fit babies approximately 3-12 months. The finished dimensions of the bib are 15 inches at the widest part, and 6.5 inches in length. The bib is adjustable with the option to fasten the button at 5 different points. - CH 1 at end of row does NOT count as SC. - Do NOT SC in the CH at the top of the PUFF stitches. - SC around the CH 1 for row after button holes. Do not SC in the actual CH. Working up the right side of your work, SC evenly across the edge of the bib. When you get to the top of the side, put 3 SC in the corner. SC in each stitch across the top of the bib. When you get to the end of the row, put 3 SC in the corner. SC across the edge of the remaining side. SL ST to first SC of border. (128 SC) Fasten off, weave in all ends. Using yarn and a tapestry needle, sew your button on the top right corner of your bib. Weave in all ends. I hope you loved making this project as much as I loved designing it! It seriously makes my entire day to see your finished projects and bib-wearing-babes, so please tag @heybabycrochet if you post a picture! If you want to follow along on my maker mama journey or see some cute pictures of baby things please check out my Instagram. Or if you want to see some of my other patterns, you can find me on Etsy or Ravelry. A huge thank you to Jessica and The Hook Nook team for this amazing opportunity to share my story and this pattern – and for inspiring so many other makers, like myself, to dream a little bigger.